An award-winning art installation exploring the world of the British bee has been installed at Kew Gardens in west London. 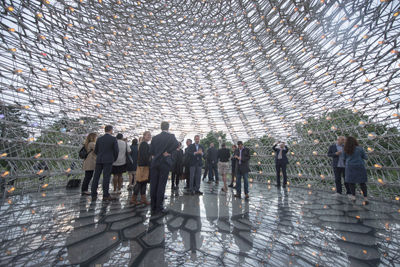 Designed by artist Wolfgang Buttress and created by BDP, Simmonds Studio and Stage One, the Hive was the centrepiece of the UK Pavilion at the 2015 Milan Expo and has become the first British pavilion to be brought home and reused. The 17 metre-high, 40 tonne installation, which has been set in a flower meadow, twists into the sky suggesting the shape of a swarm of bees. Inside, thousands of flickering LED lights create a sense of what life is like inside a beehive while a soundtrack inspired by the deep humming of the bees fills the air. 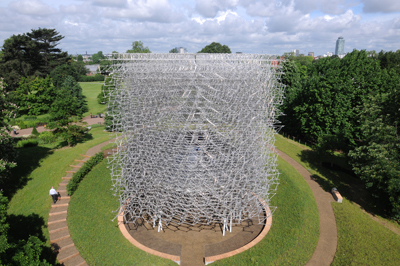 Both sound and light inside the hive will change in intensity as energy levels in a real beehive located elsewhere in the gardens changes, providing a unique insight into life inside a bee colony. Between 2nd July and 30th October, the installation is being accompanied by a ‘Pollination Trail’ across the gardens which explores the relationship between bees and plants and a series of specially trained ‘hive explainers’ will also be on hand inside The Hive. The gardens are also hosting a series of special talks, films, workshops and ‘lates’ as well as special, family-oriented events. For more see, www.kew.org. PICTURES: Jeff Eden, RBG Kew.